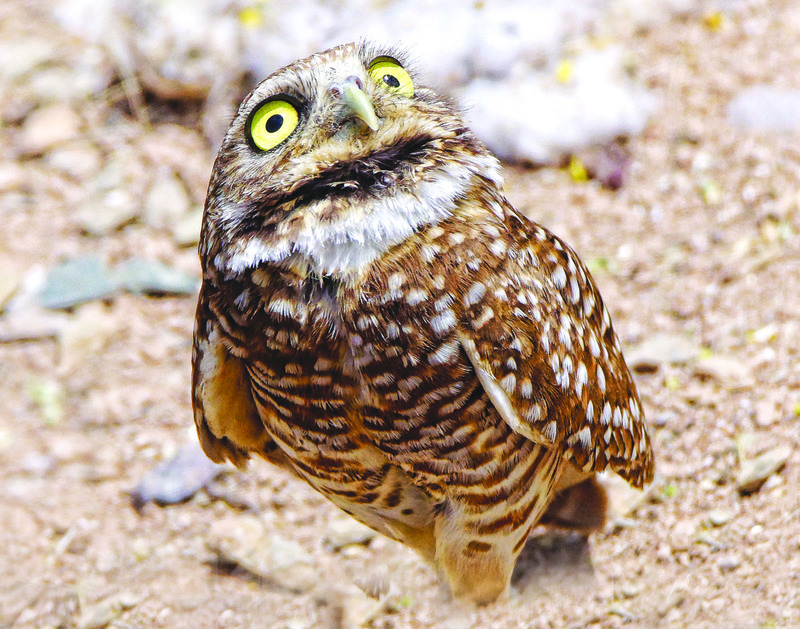 Burrowing owls have bright golden eyes. They are unmistakably one of the cutest critters running around on the ground. Their beaks can be dark yellow or gray depending on the subspecies. They lack ear tufts and have a flattened shape to their face. The owls have prominent white eyebrows and a white “chin” patch which they expand and display during certain behaviors, such as a bobbing of the head when agitated. They have a great deal of personality and style that is very amusing to watch. Adults have brown heads and wings with white spotting. The chest and abdomen are white with variable brown spotting or barring, also depending on the subspecies. Juvenile owls are similar in appearance, but they lack most of the white spotting above and brown barring below. The juvenile’s breasts are lighter buff colored rather than white. Burrowing owls have small bodies in the owl world, but they have the longest legs of any owl. This allows them to run across the ground chasing prey with ease. They can also fly up into the air at quick bursts to catch insects and other birds. They also eat small rodents. The female will lay an egg every one or two days until she has completed a clutch, which can consist of 4 to 12 eggs (usually 9). She will then incubate the eggs for three to four weeks while the male brings her food. They collect cotton from fields or soft leaves and brush to line their nests underground. After the eggs hatch, both parents will feed the chicks. Each chick hatches 2 to 3 days apart making their family of baby owls at various differences in age. The youngest chick could be a few days old while the oldest is 3 to 4 weeks old and already flying. I have observed a mother burrowing owl being very specific on which of her young she feeds. She will intentionally grab food out of an older chick’s mouth to feed a much younger chick so their portions are distributed fairly. They are extremely family oriented. The chicks will stay with the parents for extended periods of time and the older chicks will help mother with the younger chicks by alerting them when danger is near. The parents will stow away food like a squirrel and access the cache when their food supply is low. Their nests consists of a burrow in the ground and will reside there year around as opposed to most birds that only use nests for raising their young. Burrowing owls are one of the few owls that will actually make its own nest from start to finish, but sometimes they will steal a ground squirrel or gopher hole and then modify it for themselves. 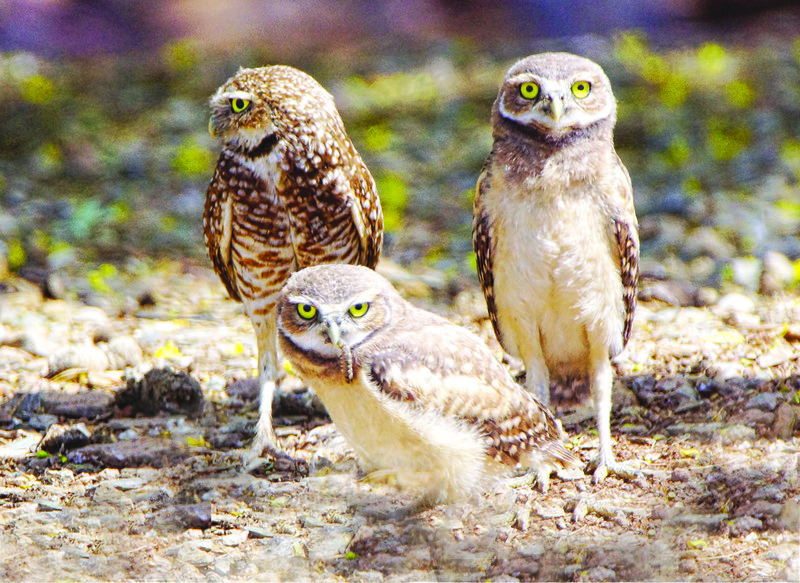 Burrowing owls have been observed imitating a rattlesnake rattle noise when they are inside or around their burrow. They do this to hopefully scare off any predators (coyotes, foxes, dogs & cats). Hawks and ravens are also predators of the burrowing owl. Like all owls, they cannot move their eyeballs around. Instead they must move their head around to focus on something. This is why owls have a reputation of seeming curious whenever they are encountered and will bob and turn their head frequently. Their eyes are large in comparison to their head. It would be like humans having eyes the size of oranges. Their large eyes help them see better in the dark night. Despite what most people think burrowing owls cannot turn their heads all of the way around. They have twice the amount of neck vertebrae that a human does which enables them to turn their head 270 degrees. In essence, this large degree of turning radius with their neck enables them to see behind them. Burrowing owls place dung from small mammals like dogs, cats and coyotes outside their burrows. This is believed to be for the reason to attract insects to the burrow for consumption purposes. Why not have dinner bring itself to your table instead of going out looking for it. 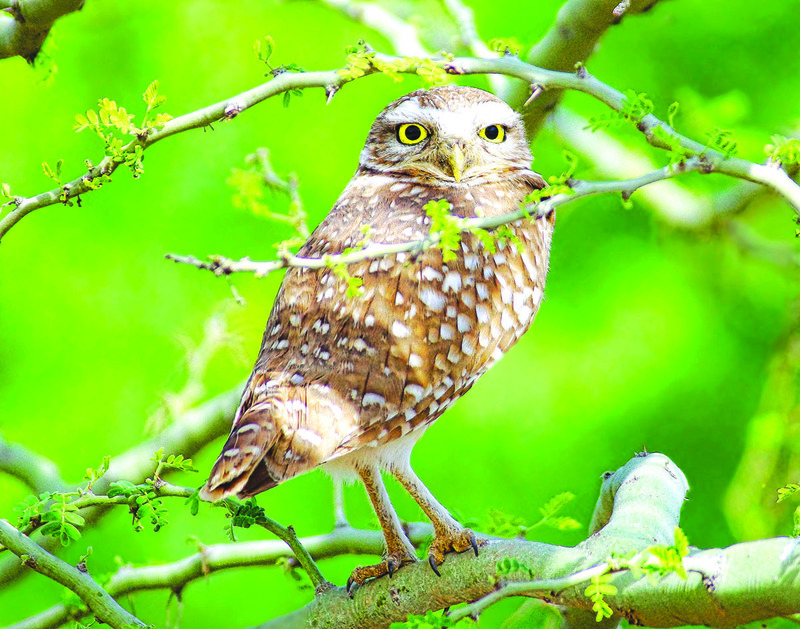 There are 23 species of burrowing owls; they all resemble each other with only slight differences. They range from Canada to the southern tip of South America. They only live in North & South America. The burrowing owls in some of these photos live near Cholla Bay surrounding Competition Hill. Their biggest threat is ATV’s and vehicles mowing over their dens. They love the desert flat areas where the dirt is soft enough to dig a burrow and where abundant food is nearby.